In 2011 I went on the launch for the Range Rover Evoque - a car that had been eagerly anticipated by many in the motoring world. It was a stylish looking 4x4 based on the LRX Concept and since its launch in the UK it has proved extremely popular and has given Range Rover a real shot in the arm. The British car maker can't sell them quick enough. So what's this go to do with the Honda Civic? Well, if you read the full review of the Range Rover Evoque here you'll notice in the practicality section that the designers went to great lengths to make sure that golfers - part of the target market - were happy with the loadbay. If you are a golfer you'll want your largest club, the driver, to fit in. The Evoque then, passes 'the driver test'. I know this because I went up to Range Rover's HQ in Gaydon where they showed us, a special room, where each part of the car could be viewed - with special goggles - in virtual reality. Part of the presentation also included the famed 'driver test' and it showed us that the designers had built in side spaces in the Evoque's boot so that the longest golf club in the set could fit in horizontally. So, as a keen golfer (but not a particularly good one) I decided to put the Civic through 'the driver test' too. 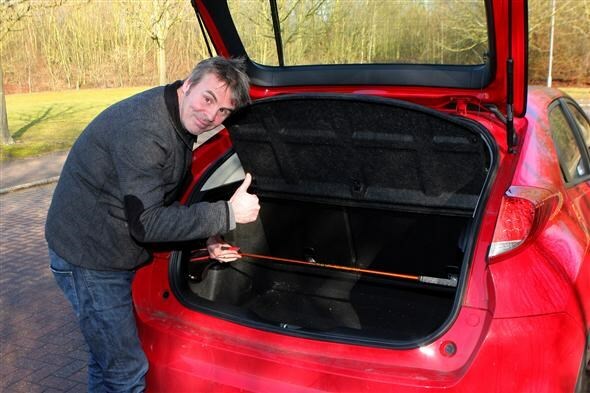 I knew that my set of golf clubs fitted easily in the Civic's loadbay, but each time I plonked them in there the driver would impede the side of the car. So I took out the clubs, extracted the driver from the bag to see if it would fit, side-on, into the Civic's boot. As you can see from the pictures it does, but to achieve this you do have to take out the driver from the bag, and place it in separately. The Civic's boot is pretty good, and we know how practical the folding rear-seat system is when you read the practicality section in our full review here. Like the Evoque, the Civic features side spaces in the boot that allow you store even wider items... like particularly long golf clubs. So, the Civic passes the driver test with flying colours but I do wonder if Honda needed a virtual reality gizmo like Range Rover's to work that out? I bet they just used a tape measure like everyone else. What do you think of the Honda Civic? Get your opinions published in our Owners' Reviews section here.